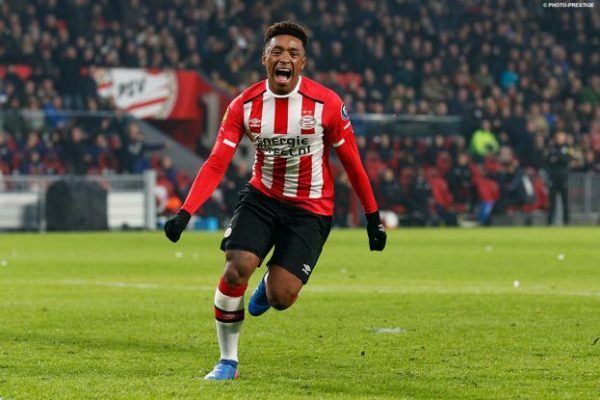 Liverpool and Tottenham Hotspur have joined fellow EPL side Manchester United in the hunt for PSV Eindhoven forward Steven Bergwijn, the latest reports from Dutch press says. The Red Devils have been keen on the flying winger all campaign but could now face heavy competition from a number of Premier League giants, according to Dutch daily newspaper De Telegraaf. Steven has been an important cog at PSV Eindhoven that sit five points clear of Erik ten Hag’s Ajax atop the Eredivisie this season. The technically gifted Dutchman has netted 11 times and added 12 assists in just 24 Eredivisie matches. His stunning form in 2018-19 seaosns has also seen the star handed his first three Holland caps – in matches against European giants France, Germany and Belgium. Manchester United’s head of global scouting Marcel Bout has been pursuing Bergwijn’s progress and recommended the player for consideration to transfer to Old Trafford. Norwegian tactician Ole Gunnar Solskjaer is already planning for life in Manchester next campaign with the coach all-but certain to be leading the squad on a permanent basis in 2019-20 campaign. However, PSV Eindhoven have no plan to allow their star asset to leave cheaply, with an offer of at least £30 million reuqired to prise him away from Holland. Bundesliga duo Bayern Munich, Borussia Dortmund and Serie A side Inter Milan are all also keen on Bergwijn, according to the Dutch outlet. It now seems certain Bergwijn will depart from Rood-witten at the end of the campaign – with a potentila bidding war on the horizon.